Frying is traditional, but it’s not the only option. Here are five ways to cook your fish for tacos. 1. Fried. The fish in the classic Baja fish tacos is fried in a whisper-thin coating, like this one made with cornstarch or this fish-and-chips-style beer batter. 2. Grilled. Healthier, sure, but also quite tasty, grilled fish adds another layer of flavor to the taco. It’s an especially good method to use when cooking firm-fleshed fish, like salmon or halibut. 3. Roasted. For the lowest-maintenance fish tacos, you can toss fillets with a quick marinade and roast them until cooked through. Roasting is especially good for delicate fillets because you don’t have to worry about them falling apart as they cook. 4. Skillet-seared. If you want to get a little golden color on your fish but don’t have access to a grill or the patience to fry, just cook it in a thin slick of oil in a hot nonstick pan. 5. Ceviche. 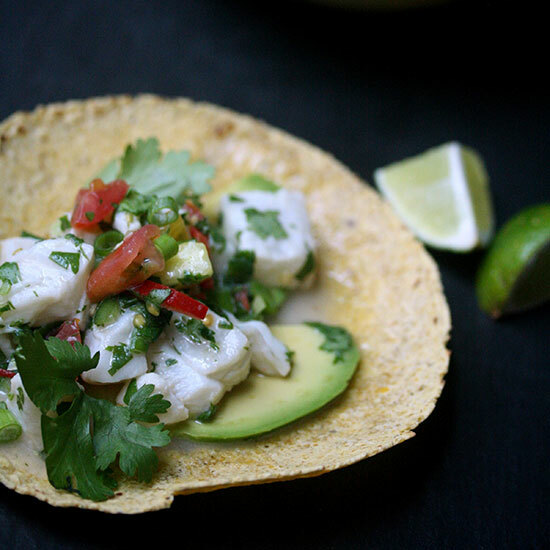 To “cook” your fish without any heat, toss it in a bright, citrusy marinade until it turns opaque, creating a mash-up of two great Mexican dishes: ceviche and tacos.